Scientists have decoded the genetic make-up of a bacterium responsible for many hospital-acquired infections - and shown why it is so difficult to tackle. Clostridium difficile caused more than 44,000 infections in the UK in 2004 - mostly among the elderly. Researchers found it can chop and change its genetic structure very easily - maximising its ability to neutralise attack by antibiotics. The Sanger Institute study is published in Nature Genetics. The researchers hope their work will aid the search for new treatments, vaccines, and diagnostic tests. The emergence of bacteria resistant to many of the leading antibiotics is a major problem facing healthcare providers worldwide. C. difficile is a particular problem, because it can only be treated with two antibiotics, metronidazole and vancomycin - and there is concern that these will also soon become ineffective. The bug is now more prevalent, and causes more deaths than the notorious superbug MRSA. It causes a range of diseases from antibiotic-associated diarrhoea to a life-threatening colon disease, called pseudomembranous colitis. The Sanger team found that half of the genes in C. difficile are absent from four of its bacterial cousins, including species that cause botulism and tetanus. The researchers also found great genetic variation even between different strains of the bug. Most important, and unlike its nearest relatives, C. difficile can readily exchange genes and resistance elements. "More than 10% of the genome consists of mobile elements - sequences that can move from one organism to another - and this is how it has acquired genes that make it such an effective pathogen. Professor Brendan Wren, from the London School of Hygiene and Tropical Medicine, also worked on the study. He said only 40% of genes were shared between the eight different strains of C. difficile analysed. The study also found that C. difficile produces a chemical called paracresol, which kills other competing bacteria, and protects it from bile acids in the gut. 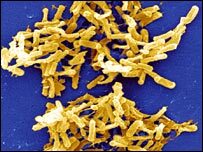 C. difficile thrives in the absence of oxygen and can "hibernate" in adverse conditions by forming spores. It is thought these spores are responsible for most human infections, and because they are highly resistant to most disinfection methods they are very difficult to eradicate, and can spread easily. Since 2003, a new and more virulent strain (called NAP1/027) has emerged in hospitals in North America and is now present in most UK hospitals.